Groom Michael Schlow and bride Adrienne Pappadopoulos. 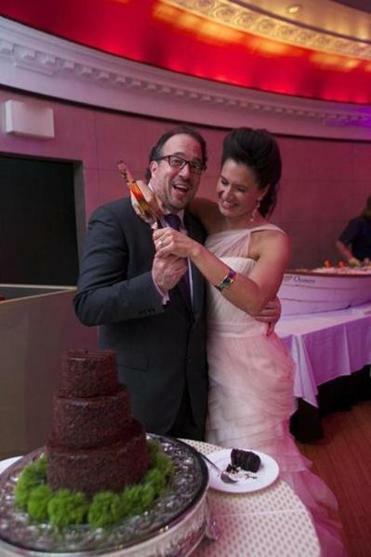 A hearty congrats to chef Michael Schlow and Adrienne Pappadopoulos, who got hitched Saturday in front of 200 friends and family. We’re told the ceremony (officiated by Larry Moulter) and reception were held at Schlow’s restaurant Radius, and the guest list included more than a few of the couple’s foodie friends. (Pappadopoulos is the owner of Andolini’s, the Italian restaurant in Andover.) Celebrating the big event were “Top Chef’’ star Tom Colicchio, Babbo’s Mario Batali, Blue Ginger’s Ming Tsai, Stella’s Evan Deluty, Oishii chef Ting San, Summer Shack’s Jasper White, Jeremy Sewall of Island Creek Oyster Bar, and Food Netwook host Guy Fieri. Also making the scene were REM singer Michael Stipe and bassist Mike Mills, with whom Schlow’s been friendly for over a decade, Peter Wolf, Sox chairman Tom Werner, restaurateur Ed Kane, stylista Gretchen Monahan, hockey Hall of Famer Cam Neely and wife Paulina, The Raptor Group’s Alex Zecca, Fireman Capital Partners’s Dan Fireman, Pats receiver Wes Welker and his fiancee, Anna Burns, “All My Children’’ actor Ricky Paull Goldin, and WAAF morning man Greg Hill. So who plans the menu at a chef’s wedding? The chef, of course. In addition to a breathtaking raw bar created by Island Creek Oyster - basically a canoe filled with ice, lobster, caviar, clams, and oysters - we’re told Schlow and his executive chef Luis Morales planned a menu featuring some of the signature dishes of their various restaurants, including Via Matta, Radius, and Tico, where at least a few of the guests were spied partying the night before the wedding. We’re told the happy couple is delaying the honeymoon until Pappadopoulos’s 7-year-old daughter, Petra, finishes the school year.